For the last 58 years, the AAN has focused on helping neurologists provide the best possible care for patients. Success in this mission is reflected in the excellence of professional education and support of research in the neurosciences. But while the academic and scientific endeavors of the organization have thrived, most practices have struggled. Economic and regulatory changes have added a substantial burden to neurology offices, leading to higher costs, lower reimbursement, and a morass of insurance companies that often restrict services. In recognition of these challenges, AAN leadership changed the status of Medical Economics and Management (MEM) to a full committee this year in October. MEM, in turn, intends to form three new subcommittees to provide additional focus and resources to issues related to coding, technology and practice management, and payment policy. The specialties and providers who lobby most effectively will no doubt get the best results for their members, be they hospitals, pharmaceuticals, durable providers, ancillaries and allied health, or physicians, Dr. Nuwer explained. There is also constant competition for a larger cut of the reimbursement pie between surgeons, radiologists, specialist physicians, and primary care. “This is a huge task, and it falls to MEM to handle it,” he said. “There are a multitude of challenges MEM faces,” said current MEM Chair Laura B. Powers, MD. “These include cuts to Medicare reimbursement, pay-for-performance (P4P) measures, and a pending crisis in healthcare due to rising costs, to name a few. MEM needs to continue to strive to maintain a high level of advocacy with the Centers for Medicare and Medicaid Services (CMS), the RVS Update Committee (RUC), and Current Procedural Terminology (CPT) Advisory Committee for fair reimbursement, make sure that neurology is treated fairly with P4P, work with the Legal Affairs committee to get the Medicare payment formula changed, and maintain the best information possible regarding practice management issues, especially EHR,” she said. MEM also intends to enter into the hospital arena for members as stroke neurologists and neurology hospitalists who derive income from their work with hospitals, she added. MEM volunteers, who bring a breadth of expertise in coding, business, and insurance issues to the Academy, shared some of their own practice management pearls with Neurology Today. Some rules work against you and appear unfair. Others work in your favor and appear generous. “Know the difference, and know how to use them in your favor when you can,” advised Dr. Nuwer, who has taught E&M at courses for the past 14 years. “After 23 years in practice with a group ranging in size from three to nine doctors, I have found that one key to success is having ground rules from the start,” said Dr. Powers. Setting policies about call, office time, dictation turnaround, and vacation is a good place to start, she explained. Saty Satya-Murti, MD, who served as a consultant (1991–95), and later as the Medicare Carrier Director for Kansas, Nebraska, and Northwest Missouri at Blue Cross Blue Shield of Kansas (1995–2005), offers suggestions for communicating with payers. Among effective strategies, he said, are to write a formal personalized letter (preferably not an e-mail) the first time to the administrator or medical director, and confine yourself to one or two specific issues at a time. Early in your letter, state the reason for writing, and reemphasize it at the end. Keep early communications short – to no more than two pages. Be logical, and use scientific evidence if available. Finally, request a response, provide a return contact, and remind gently if there is no response in about four weeks. Dr. Satya-Murti also suggests strategies to avoid: Do not ramble. Be factual and curtail generalizations. Avoid hyperbole, ad hominem, and threats of appeal to higher authority. Personalize communications; do not mass-mail templated contents. And, most important, do not mail a missive right away that might have angry emotional content; set it aside for one to two days, then consult a trusted friend or colleague before dispatching. “If you have a busy practice, hiring a physician assistant (PA) or a nurse practitioner can be a lifesaver,” said Neil A. Busis, MD, a former AAN representative to the RUC and Practice Expense Advisory Committees. He has found that having a bright PA make rounds on follow-ups in the hospital can save him a lot of leg work and give him more free time. With many new hospital consults each day, it makes sense for him to focus on formulating diagnostic and treatment plans for the acutely ill patients, while his PA is making sure his recommendations are carried out and modified as the clinical picture unfolds. “After hiring a new associate physician, I'm now considering a second PA to help out in the practice,” he said. “Hospital charges are paid more often and more promptly if they are sent to the covering insurance as soon as possible,” advised James J. Anthony, MD, AAN alternate representative to the RUC. He explained that the sooner the claim is submitted, the more promptly it can be paid. He added that it also increases the likelihood of payment, particularly for patients who have had multiple consultants involved in their care. “I use a printed hospital list each day, record my visits, and turn it in on the following day. That way, the charges can be posted within two days of the visit,” he said. “Patients at the Henry Ford Medical Group are instructed to call their pharmacies when they need refills,” said Gregory L. Barkley, MD, who relies on his electronic prescribing program for medication management. An online message from the pharmacy notifies the doctor when a refill is requested and it simply takes an approval to finish the task. “It saves the staff and doctors unnecessary phone calls and patients don't have to deal with telephone tag or lines at the pharmacy,” said Dr. Barkley. MEM will be holding two courses as part of the AAN Winter Conference in Lake Buena Vista, FL, on Friday, January 12, 2007: The Electronic Office Program, 9 AM-1 PM, and the Practice Management Program, 2–6 PM. 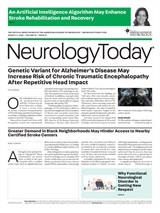 Neurology Today6(24):23-27, December 19, 2006.